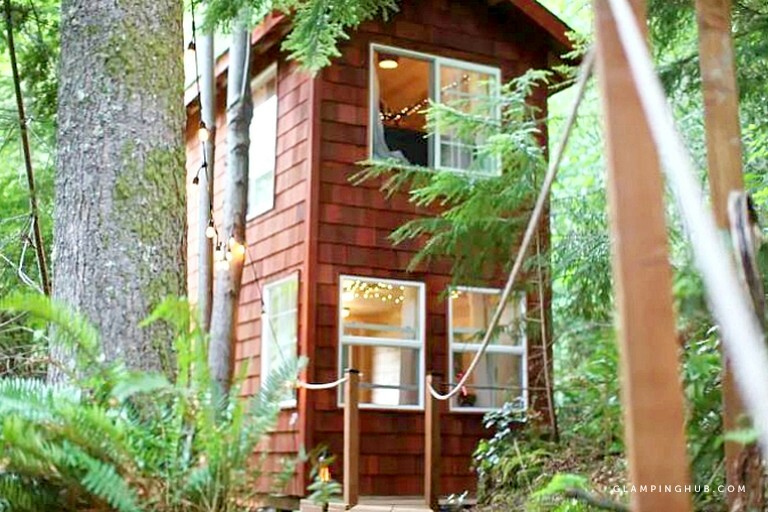 This idyllic tree house is located in Snohomish, Washington, and can accommodate three guests. 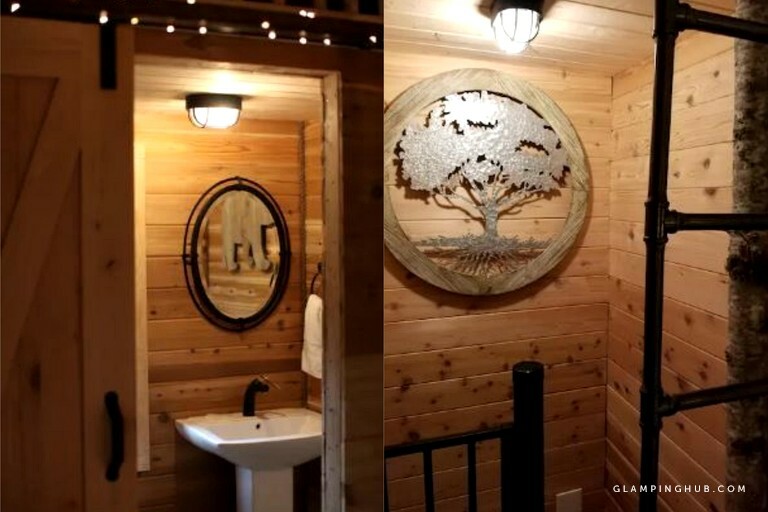 There is one cozy bedroom and one-half bathroom. The bedroom has a lovely queen-size bed, while there is a small loft area that can sleep a child. In the half bathroom, there is a toilet and a sink. Linens and towels are provided. In the living room, guests will find a luxurious soaker bathtub, a stunning fireplace, a mounted flat-screen television, and a rocking chair. The fully-equipped kitchenette has a sink and an area to prepare meals. Other amenities include Wi-Fi and heating. 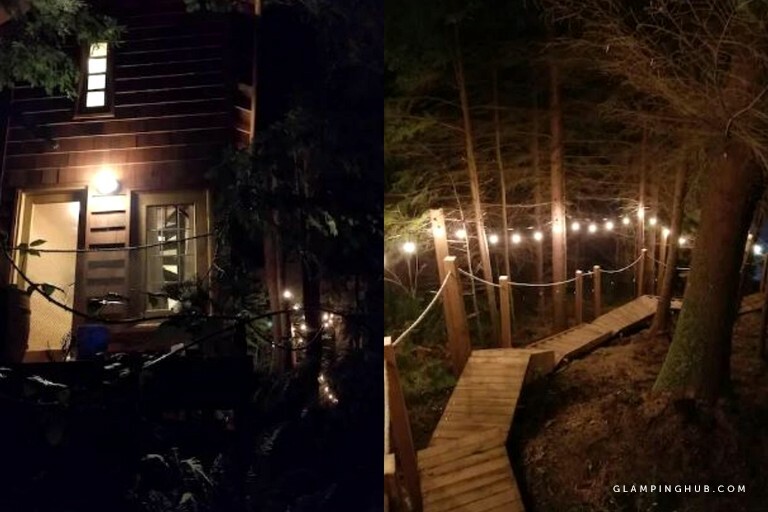 Guests of this unique vacation rental will enjoy a television, Netflix, and free Wi-Fi. There is a luxury soaking bathtub, while a stone fireplace and heating keep the space warm and cozy all year. Outside, there is a balcony with remarkable nature views and a barbecue. 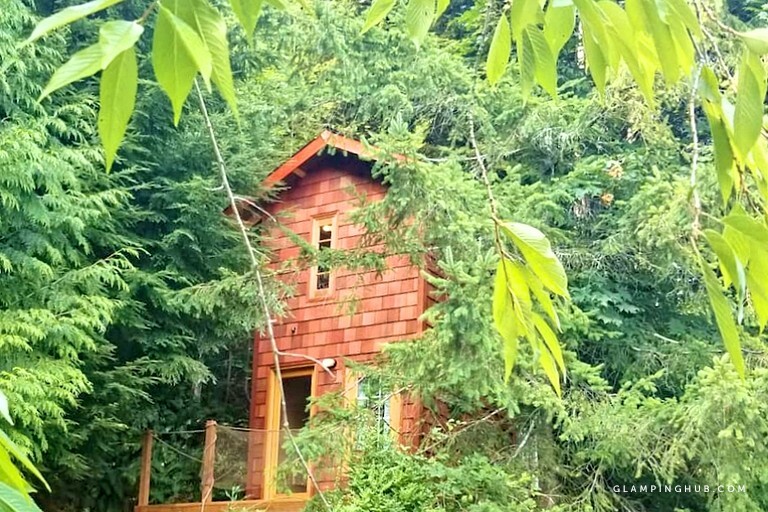 This fantastic vacation rental is settled on a hill surrounded by trees on approximately three acres in Snohomish, Washington. There are hundreds of acres of state land on two sides of the rental, allowing glampers easy access to prime hiking. Lake Roesiger is only six miles away and boasts a swimming beach, a boat launch, and a public park. 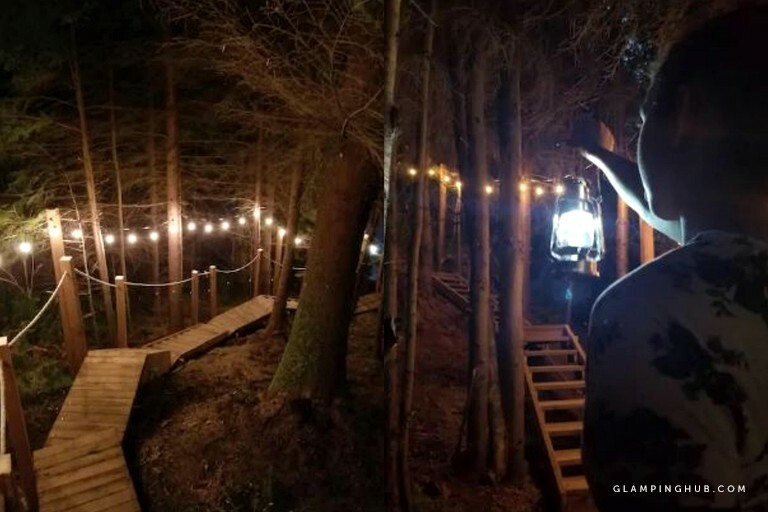 Nestled in the woods, glampers can go hiking and mountain biking directly from the rental, spotting a variety of wildlife and beautiful local plants. Downtown Snohomish is a mere 20-minute drive away, where glampers will enjoy the charming small-town vibe, exploring antique stores, grabbing a drink at a bar, or eating at one of the many delicious restaurants. Snohomish is also perfect for shopping, with a range of friendly stores waiting to be visited. The area is known for its fantastic breweries, and guests should not leave without stopping by Lost Canoe Brewing, Haywire Brewing, or Sound to Summit Brewing. Wineries like Chateau Ste Michelle Winery and Novelty Hill Januik Winery are also close by and offer tastings and tours. In the winter, glampers can make the 60-mile drive to Stevens Pass Mountain Ski Resort for downhill skiing and snowboarding. Guests should remove their shoes when they enter the rental.